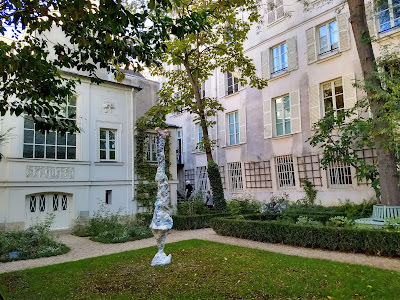 Today I’d like to share information and photos from two Paris museums which are not the Louvre, but held a special attraction for me. Both are much smaller and less overwhelming than the Louvre, and are worth a visit if you have the time and inclination. First up, the Cluny Museum, also known as the Musee National du Moyen Age. 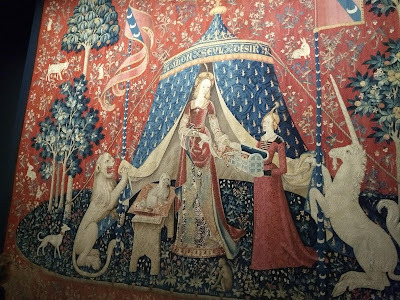 When I was researching Paris, I came upon the description of some tapestries, known as the “The Lady and the Unicorn,” housed in the Cluny Museum. 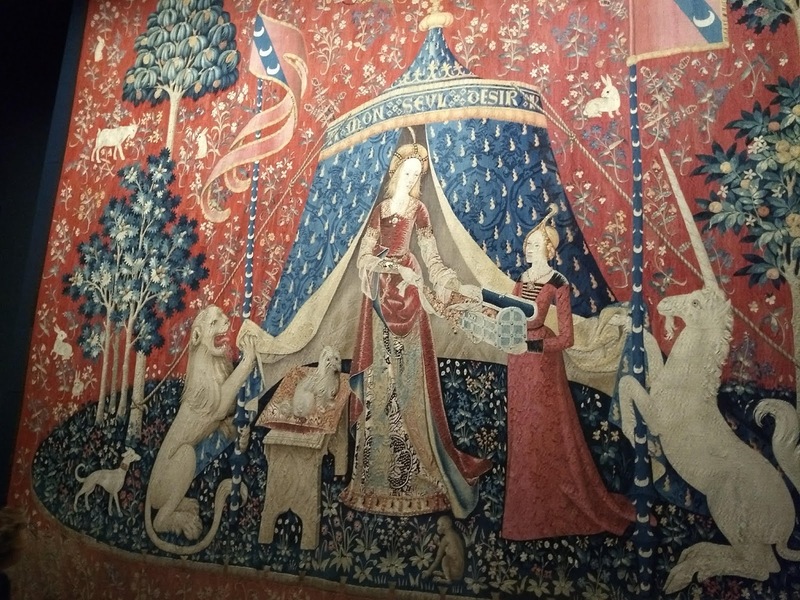 I’m not generally interested in tapestries, but for some reason these intrigued me and though I didn’t know if I’d have time to visit the Cluny, I tucked away the information for future reference. 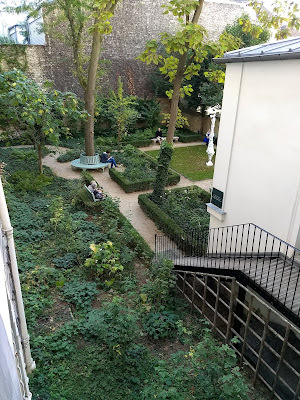 As luck would have it, our workshop hotel (Hotel Mercure—no affiliation), was just a couple of blocks from the Cluny. 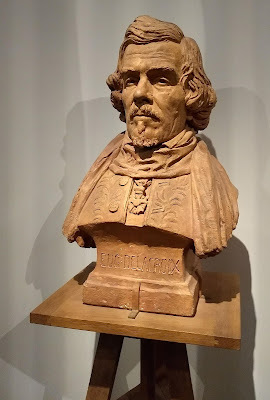 Since we had a free afternoon on check-in day that just happened to be the first Sunday of the month, when museum admissions all over Paris are free, we joined the crowds moving through the exhibits. In addition to the tapestries, the Cluny houses a collection of French medieval art, as well as the ruins of a second-century Roman bath. There is also a “medieval” garden you can visit without museum admission, laid out with plants pictured in the famous tapestries. 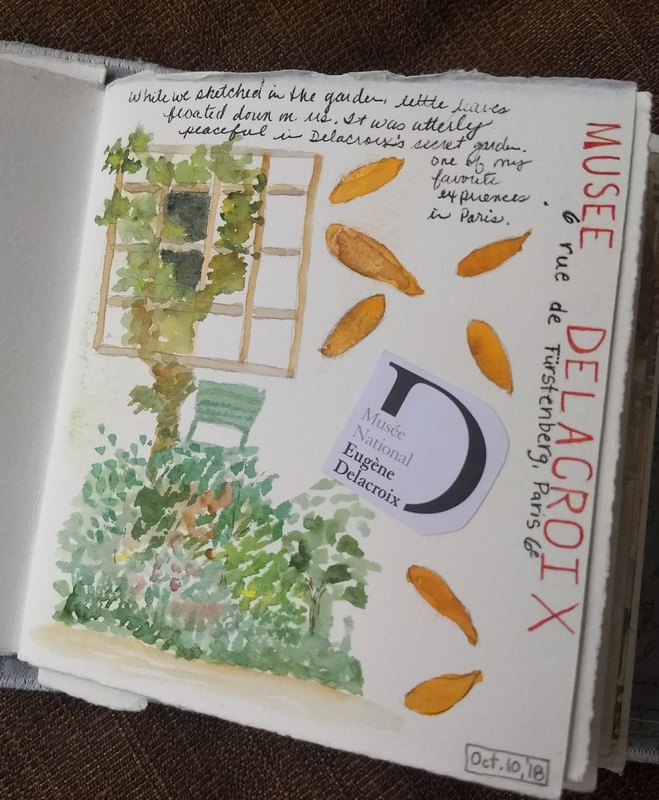 Before we left for Paris, I had been reading the Journal of Eugene Delacroix. 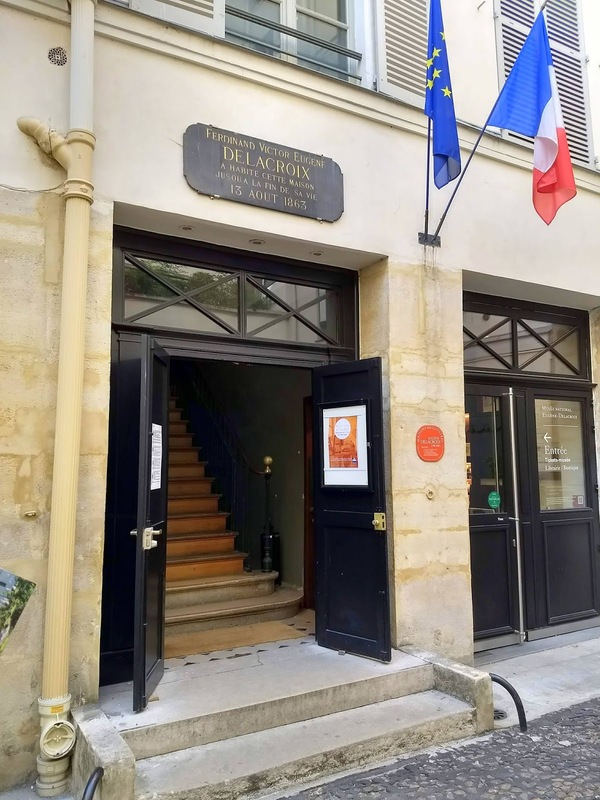 In addition to being one of the greatest French painters of the Romantic era, Delacroix was an interesting man, and quite thoughtful about life and his painting. Some of his most famous works, including Liberty Leading the People, hang in the Louvre, and he is also known for his murals in the Chapelle des Anges in Saint-Suplice church. 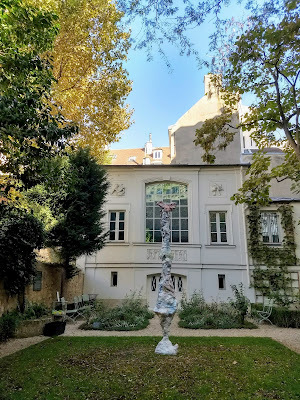 I’m incurably nosy about seeing where artists and writers do their work, so I hoped that I’d be able to visit this museum, which consists of the apartment he lived in from 1857 until his death in 1863, his studio, and a small, private garden. Once more, luck was on my side, and we were also within walking distance of this museum. The entrance was tucked away in the corner of a quiet square, the Place de Furstenberg, and we almost missed it. 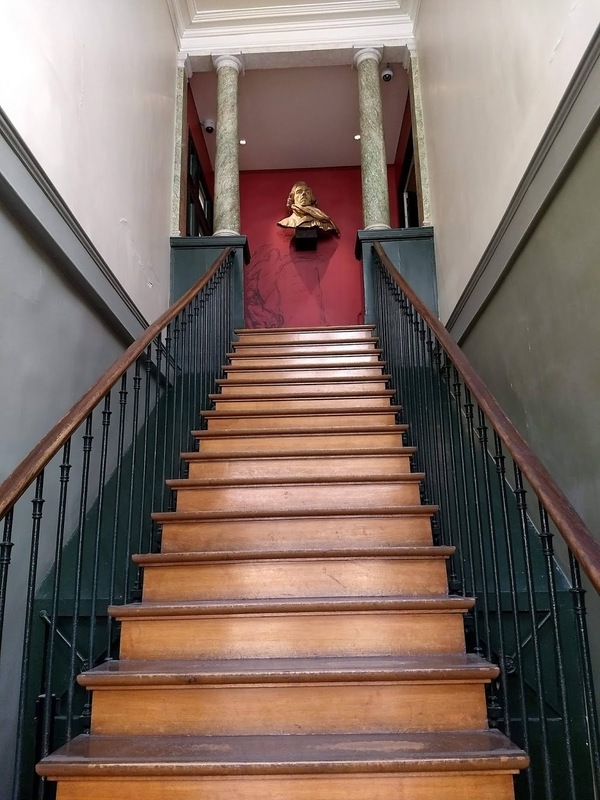 His apartment was an example typical Parisian architecture of the late 18th century, and his large, bright studio was built to his specifications. The dimensions of the studio surprised me, but shouldn’t have because of the size and scale of some of his work. The best part was the garden, which is hidden from the street, hidden behind the apartment and studio. Laure and I sat and sketched there until we had to return to the hotel to meet the rest of the group. The time we spent in this oasis of peace and quiet in the middle of bustling Paris was one of my favorite experiences of the whole trip. No matter what your interests, there is something in Paris for you. Have you been to Paris? What were your favorite experiences? Yes, Cheryl, I think you need to go back to Paris! I was surprised at how appealing the tapestries were. I almost bought a little pillow with a bunny motif! Kathy - great photos of the Museums as well as the tapestries. Isn't it hard to imagine something that old being in such lovely shape. So glad to see your sketch book too. Looks like you found a beautiful place to work. Thanks for sharing. Thanks, Debbie. The tapestries were amazing, and Delacroix's home and garden were so peaceful.